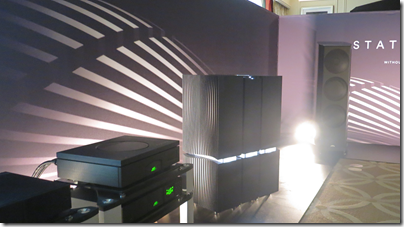 I was fortunate to hear Naim’s Statement amplifier, currently a prototype subject to final tuning before release in July, at the CES exhibition in Las Vegas. 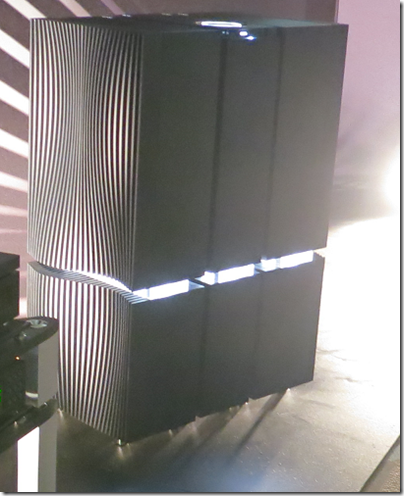 Statement is actually two amplifiers, the NAC S1 pre-amplifer and the NAP S1 mono power amplifiers. In the above picture you can see them standing together as three large vertical boxes, the slimmer pre-amp and the power amps on either side. Each amplifier is also divided horizontally, with the power supply below and the amplifier electronics above. I do not have confirmation of the price but believe it will be around £150,000 for a set. My quick comment is this. 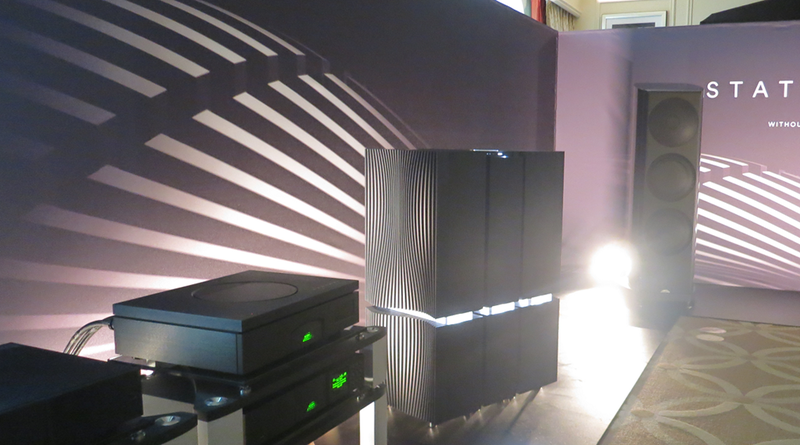 The sound is huge and has the qualities Naim aficionados love: muscular, etched, authoritative. Naim is often considered to have a house sound dating back to its earliest electronics in the eighties, and the Statement continues that tradition. I did not think the sound was flawless though. Rhythm and percussion was stunning, but whether it is the most natural sound I am not so sure. Can Statement do sweet and delicate? Bear in mind though that I only had a short listen and that some fine-tuning remains. Naim says the sound is without compromise, and Statement will only appeal to those who are not only wealthy, but share that attitude, building their living space, or at least their music listening space, around the electronics, rather than having it blend into the furniture Bang & Olufsen style. First thought: Naim still exists!? Second thought: Good to see they’ve stuck with their design principles of awesome ugliness and hilarious pricing! I remember checking out some Naim components back in the 1990s but they always seemed to charge more for fewer features than even other high-end manufacturers.